Minister responsible of Fisheries Hon. Alexis Jeffers signs an agreement to amend the grant agreement for the project for development of a Community Fisheries Centre in Charlestown at his Charlestown Office while General Manager of the JICA office in the Dominican Republic Morita Tatsuya looks on. 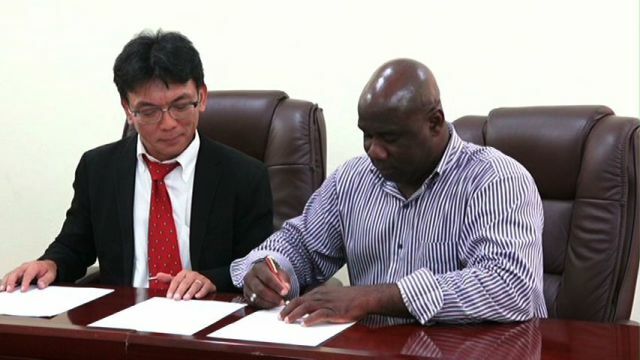 CHARLESTOWN NEVIS (September 23, 2015) — An agreement to amend the grant agreement for the project for development of a Community Fisheries Centre in Charlestown was signed on September 22, 2015 between the Nevis Island Administration and the Japan International Cooperation Agency (JICA) office based in the Dominican Republic to extend the life of the project. Minister responsible of Fisheries Hon. Alexis Jeffers signed the agreement at his Charlestown office in the presence of General Manager of the JICA office in the Dominican Republic Morita Tatsuya. In brief remarks Mr. Jeffers described the agreement as a significant and symbolic and one which signals that the fisheries project is in fact alive and well. “Today is a milestone, so to speak, and today represents another step forward in terms of bringing this project to fruition and we look forward to the day when we can start construction in Bath Village,” he said. The Fisheries Minister explained that the agreement would extend the life of the project for another year so that the necessary technical studies could be done over the next year at the new location in Bath Village. He used the opportunity to thank the government and people of Japan for their understanding that the project was important to the livelihood of fishermen on Nevis and its economic significance to the island. He also applauded Minister of Foreign Affairs Hon. Mark Brantley and the Federal Government for their intervention. Mr. Jeffers stated that he was pleased that the negotiations which led to the signing were done to secure the agreement signing. He also noted that the NIA was appreciative of the gesture on the part of the government and people of Japan and indicated that more would be said about the project in the near future. According to Mr. Jeffers, the project was initially slated for construction at the end of Prince William Street in Charlestown. However, it was felt by the sitting administration that that location would not allow for the appropriate expansion. “We figured that in terms of providing some long-term benefit to the fishermen here on Nevis, it was appropriate to seek a new location. “We have decided that Bath is that location. It represents an area that we believe can be expanded to accommodate repairs to fishermen’s boats and also an expansion of Charlestown as well,” he said. The Fisheries Minister explained that Bath Village was selected because it was felt it offered the scope needed for development and advancement of the fishing industry on Nevis. 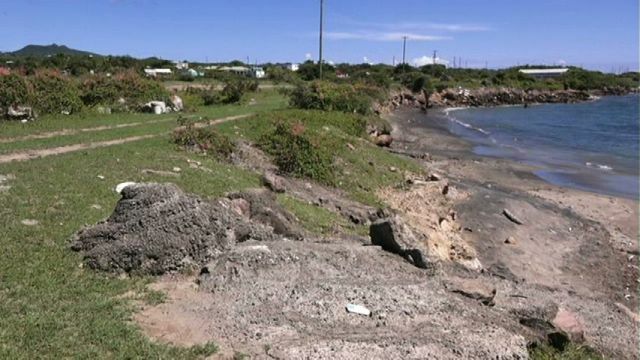 He said it was once a vibrant fishing community and the project would restore that vibrancy and would also ensure that the fishermen from throughout Nevis would benefit from it. Also present was Sam Heyliger of the Department of Marine Resources in St. Kitts and Fisheries Extension Field Officer on Nevis Kareem Wilkin.